Nia tones your mind and tunes your body. 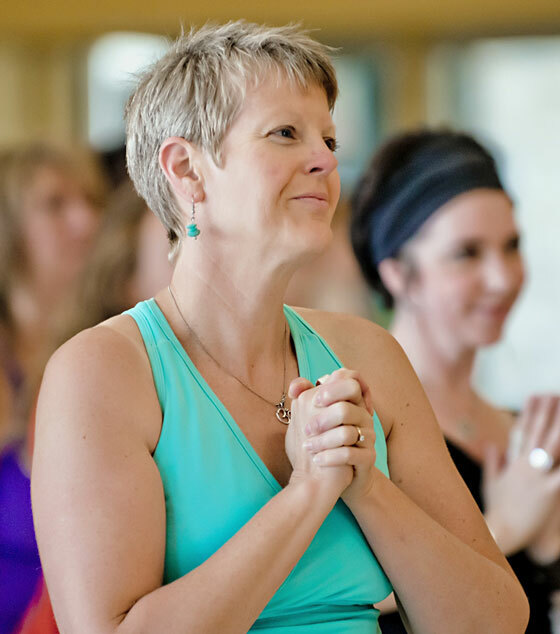 Each workout brings mindfulness to your dance movement experience leaving you energized, mentally clear, and emotionally balanced. Nia cardio­dance workouts combine 52 simple moves with dance arts, martial arts, and healing arts to get you fit in 60 minutes ­ body, mind, emotion, and spirit. Connect through movement to yourself, your child and your community. Self care to support your best self. Endless benefits for your baby. St. Marys are Sessional. Drop in’s are welcome. 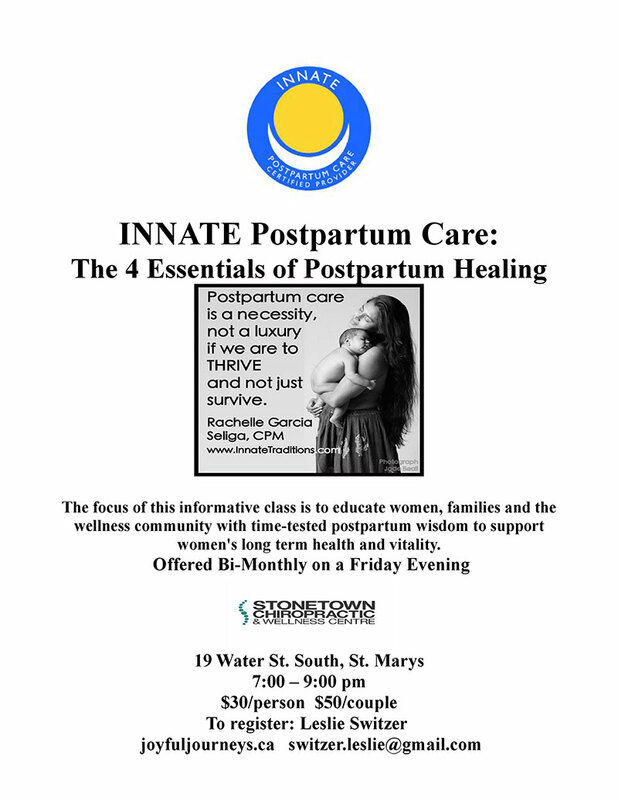 Parking off of Peel St.
Feel­ good prenatal fitness, essential birth education, and celebration of pregnancy and birth, all rolled into one profound & powerful class that supports you at every stage, from pre­conception through postpartum.  Each signature move and technique is designed to guide your baby into the optimal fetal position, and enable you to effectively work with your baby and your body for a birth experience you’ll love. Discover the keys to activating your birth instincts for a safer, easier birth! After you give birth, come full circle and wear your baby to class for postpartum fitness, parenting education and bonding with your baby. 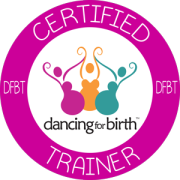 Dancing For Birth™ offers classes and trainings/workshops on four continents and was founded by Stephanie Larson, a birth doula, childbirth educator, dancer, perinatal fitness expert and mother of four. 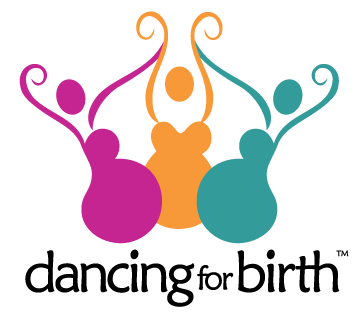 Sessions are offered in 6 week increments providing safe and effective prenatal/postpartum fitness and covering a wide variety of childbirth and parenting topics.  It is not necessary to start at the beginning of a session. Many woman find it beneficial to attend several 6 week blocks throughout their pregnancy and early postpartum. 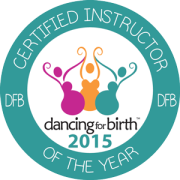 Interested in learning more about DFB but not sure you want to commit to a full session? Attend a class as drop in and if you decide to join for the remaining session your fee will be adjusted. 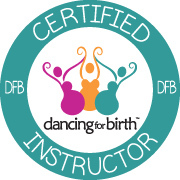 You are welcome to make up a missed class anytime postpartum with or without your baby at a DFB™ class or Community Nia class. St. James Anglican Church Parish Hall, 65 Church St. South. Supporting the women you love through the birth process. This workshop is designed for couples to learn about instinctual birth, comfort measures and to harmonize with each other in your role as parents. 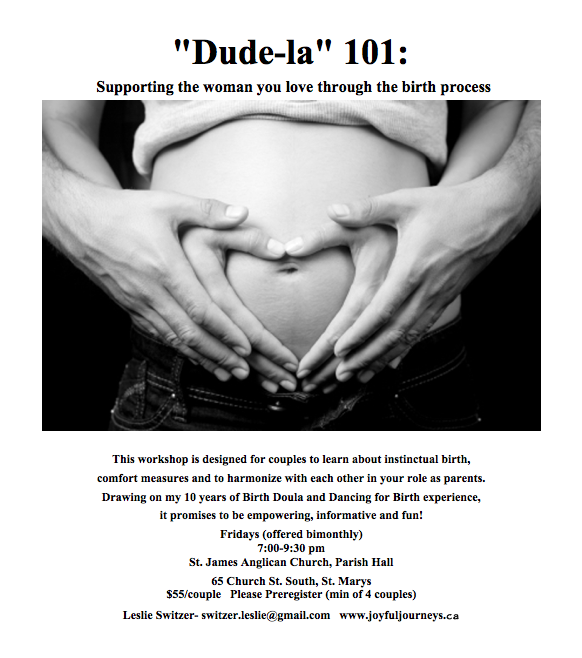 Drawing on my 10 years as a Birth Doula and Dancing for Birth experience, it promises to be empowering, informative & fun! 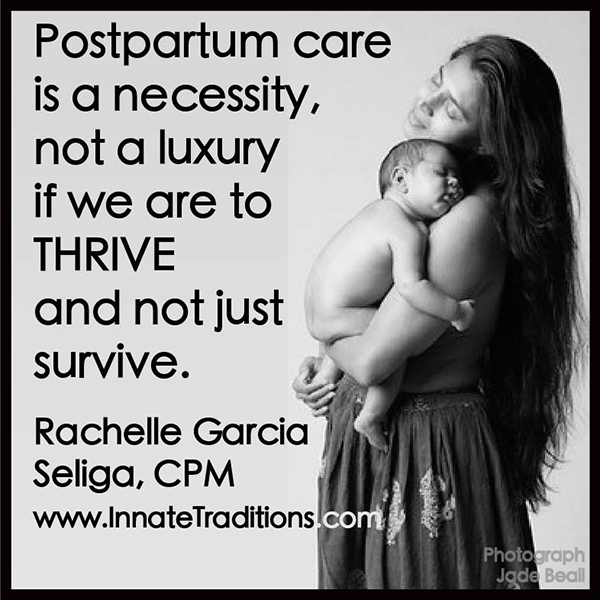 This valuable class discusses 4 time tested essential postpartum care practices for women post birth which affects their long term health and vitality. 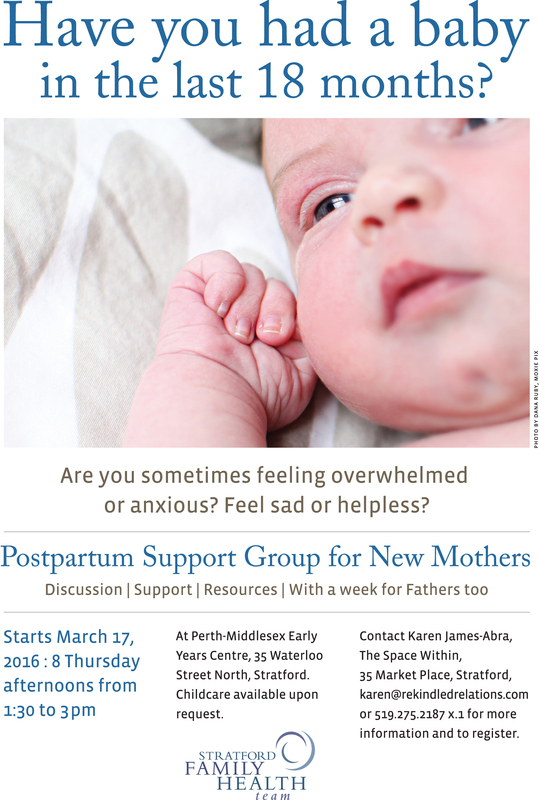 Please consider attending this class before your baby arrives with someone who will be supporting you in your postpartum time, or attending anytime during the first year after your baby is born. This class is also an excellent resource for anyone working with postpartum women in the wellness community. Please contact me if you would like to bring this 2 hour workshop to your community. Have you had a baby in the last 18 months? Are you sometimes feeling overwhelmed and anxious? Feeling sad or helpless? Our first collaboration was a great success and you have asked for more. Stay tuned! You may also use this form to register for any of the classes listed. If you have any questions about my services, or would like to get in touch with me, please complete the form below to send an email. Write your message in this box. If you are registering for a class, let me know which session. I'll get right back to you!